Meanwhile, the first official leak from Beijing has surfaced on the expected leadership succession next month. A Chinese Communist official confirmed that current Vice President Xi Jinping will become the next Chinese supreme ruler. However, his power will be limited at first. The leadership changes in the world’s most populous nation come amid China’s decades-long military buildup and growing tensions with its neighbors in the region, most recently Japan. Xi signaled his position on the Senkaku islands dispute with Japan recently, calling Tokyo’s claims to maritime sovereignty a "farce." The comments followed an unusual disappearance by the leader, who apparently sought to avoid showing where he stands on the dispute before a major Party meeting. The comment is a sign Xi has sided with hardline nationalist-communist forces within the military and Party who in recent weeks have issued warlike threats against Japan. For the United States, the Bo case highlights a growing split within what U.S. intelligence agencies previously viewed as a politically homogenous leadership. Now there are concerns that hardline, anti-American forces could overtake more cautious Beijing bureaucrats who favor less aggressive defense and foreign policies as a way to avoid disruptions in the current economic modernization plan. New questions about China’s future leaders also are taking place as the United States shifts eastward, with a new policy of bolstering military and diplomatic power in Asia to protect freedom of navigation and friends and allies in the region who want a counterbalance to the growing threat posed by China. Bo’s fate could be decided before the leadership changes are announced at the 18th Communist Party Congress, now set for mid-October. He likely faces a decade or more in prison, according to U.S. officials and non-government China watchers. 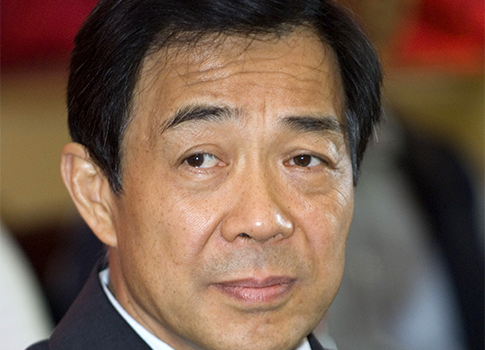 The disposal of the Wang case "suggests the Party leadership now agrees Bo Xilai must face criminal charges—not just intraparty disciplinary punishment," said former State Department China specialist John Tkacik, who believes Beijing will avoid prosecuting Bo until after the Party meeting to avoid tarnishing the new leadership. "I suspect the case will be complicated because it doesn't appear that Bo Xilai has yet made a full confession to Party discipline adjudicators, and no doubt Bo's rivals in the leadership are arguing that Bo's failure to come clean when he had the chance makes him unworthy of sympathy," Tkacik said. A trial for Bo also is expected to undermine his allies in senior leadership posts, including Politburo member Zhou Yongkang, a key Bo supporter and the top Chinese security official who controls crucial power organs, including the judiciary that will sentence Bo. Bo was fired as regional communist party chief in Chongqing last March following Wang’s dramatic flight to the U.S. consulate in Chengdu. Wang revealed that Bo’s wife arranged the murder of a British businessman, and provided other details on Chinese leaders. A month later Bo was stripped of all party positions, including suspension of his seat on the 25-member Politburo and 300-member Central Committee. Wang’s attempted defection after a dispute with Bo led one Chinese official to remark, "When the dog can no longer hunt, he is boiled and eaten." Wang was turned away from the U.S. consulate and his request for political asylum rejected after a series of telephone consultations among senior Obama administration officials. He was then taken into custody by a senior official of the Ministry of State Security, China’s political police and intelligence service, and did not surface again until his trial last week. China at one point asked the Obama administration to return documents Wang had turned over to U.S. consulate officials. It could not be learned whether the administration cooperated with Chinese authorities in prosecuting Wang. A State Department spokeswoman declined to comment when asked if the U.S. cooperated with Beijing in the case. Earlier, Bo’s wife Gu Kailai and an associate were imprisoned for the murder. Four other Chongqing police officials also were punished for covering up the crime. On Monday, Wang was given a 15-year sentence, a relatively light term since defection—depicted in the Chinese language as a combination of the characters "betrayal" and "flight"—is a capital offense that within the communist system can mean the death penalty. "My acts were crimes, and I hope the serious impacts [caused by my acts] both at home and abroad would be eliminated through the trial," Wang was quoted by the Xinhua News Agency as saying. "Meanwhile, I hope the trial will issue a warning to society and let more people draw lessons from me." The charge of defection is rarely discussed in public in China. Other charges against Wang included bribe-taking and "bending the law for selfish ends," China’s euphemism for abuse of power, regarding a cover up of the murder of British national Neil Heywood in November. No mention was made during any of the recent trials of the reported $6 billion Bo and his wife were seeking to move to banks outside of China. An official said such high-level corruption among Chinese leaders is rampant; as a result, only murder-related charges were highlighted, in order to avoid focusing attention on the financial corruption among senior communist leaders. With the Wang case finished, China’s leaders must now turn to settling the Bo affair, the biggest political scandal since the 1976 arrest of Mao Zedong’s wife and three other associates, who were blocked from seizing power in what became known as the Gang of Four conspiracy. Over the past several years, Bo emerged as China’s first Western-style politician, and was known for his high-profile efforts to restore Cultural Revolution-style Maoism. He presided over mass rallies where crowds sang communist songs and praised communist ideology. Bo, who as a Politburo member had the support of several key Chinese leaders in his Maoist revival efforts, also once boasted of controlling local army groups. His high profile apparently upset more reformist communist leaders in Beijing, who saw Bo as a challenger for power and someone who upset the Communist government’s less-doctrinaire economic policies. A government expert who specializes in internal Chinese affairs said the handling of Bo, whose dismissal came months before his expected promotion to a position on the nine-member collective dictatorship that rules China, was revealed in details of the Wang trial made public last week. A lengthy state-run Xinhua Sept. 19 report on the Wang case linked Bo for the first time to the Wang-Gu murder and subsequent cover-up. Testimony during the trial revealed that on Jan. 28 Wang reported to "the then leading official of the Communist Party of China (CPC) Chongqing Committee"—Bo Xilai—that Bo’s wife was the chief suspect in the Nov. 15 poisoning of family friend Neil Heywood at the Lucky Holiday Hotel. "On the morning of Jan. 29, Wang Lijun was angrily rebuked and slapped in the face by the official," the news agency stated. A witness testified at the trial that the conflict between Wang and Bo "was made public" after the slapping incident. That eventually led to Wang’s Feb. 6 flight to the U.S. consulate in neighboring Chengdu, where he stayed in the embassy overnight as Chinese security personnel massed outside after consulate phone calls to Beijing were intercepted. Armored vehicles from Chongqing were photographed massing in a border region in what U.S. officials said was a plan by Bo to use force to prevent Wang from defecting and revealing the corruption. Inside the consulate, "Wang immediately claimed that his personal security was threatened because of his investigation of criminal cases." He "asked the United States to provide shelter for him and filled out an application for political asylum." The official Chinese account of the case confirms earlier Free Beacon reports that Wang had sought political asylum but was turned away after discussions among administration officials and intervention by the office of Vice President Joe Biden. Biden’s office was concerned that granting asylum to the defector would have upset U.S.-China relations prior to a visit by Xi, the Chinese vice president, that began Feb. 14. The Xinhua dispatch also repeated the State Department’s official explanation of the affair, which said Wang left the consulate "of his own volition." It added, however, that he gave up "through the persuasion and advice of relevant organs of Chongqing Municipality and central authorities." The statement appears to be a face-saving gesture by Beijing to limit the embarrassment of the United States for rejecting his appeal for asylum—an apparent violation of a U.S. law requiring any person who is threatened to be granted asylum. During his stay, Wang talked about "environmental protection, education, and science and technology with diplomats," Xinhua said. Wang then "immediately claimed that his personal security was threatened because of his investigation of criminal cases." Critics have said rejecting Wang’s asylum was a major intelligence failure that prevented gaining access to a senior communist official with access to secrets who could have provided valuable details of China’s secretive leadership. Financial Times Beijing correspondent Jamil Anderlini, in a recently published e-book on the case, quoted a Chongqing Party official who worked closely with Bo as saying: "Bo and his ambition were seen as the most dangerous force in Chinese politics and people inside the Party always compared him to Hitler. "He was a Marxist Leninist who opposed western liberal democracy, but the irony is that if the Chinese people were allowed to vote, he probably would have been elected president," the official said. This entry was posted in Politics and tagged Bo Xilai, China, Wang Lijun, Xi Jinping. Bookmark the permalink.